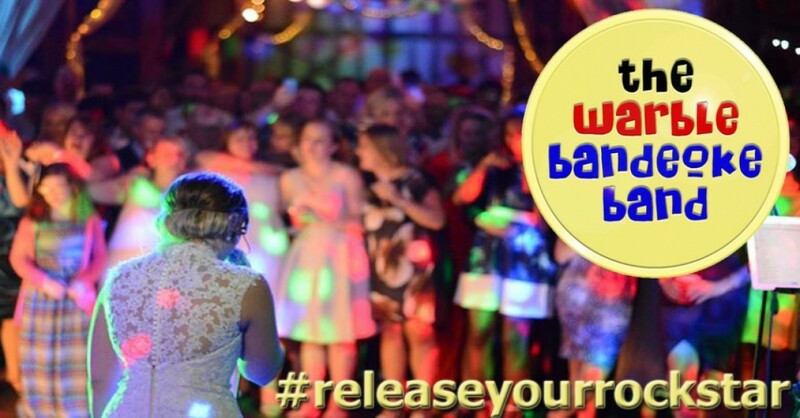 Bandeoke Band for Hire - Karaoke with a Live Band! Warble is home to the longest running, most rocking, party inducing, 5-minutes-of-fame-giving, bouncing, memory creating, guest interactive Bandeoke band in the WORLD. OK, well we might not know about the entire world, but we do know these guys are the best bar none at getting you and your guests into a party mood before smashing it through the roof (sometimes literally), creating a party neither you nor your guests will forget in a hurry. The Warble Bandeoke Band allows your guests, friends and family to enjoy 5 minutes of fame with a REAL LIVE BAND on stage! Bandeoke isn’t just a fun evening with your friends, colleagues, lovers, mortal enemies, or anything else you may come up with, it’s an experience that only a very few people can claim to have had! The Warble Bandeoke Band know that each person coming on stage is often fulfilling a lifetime ambition and so the band go out of their way to make sure each song gives both the singer and audience the best possible time. This is as close to being a rockstar as you can get without actually going out, kidnapping and then impersonating Bono.